Super Bowl XLIV - Cursed To First - Sox and Pats forever. bus stop..., originally uploaded by JustUptown. I realize that as a Patriots fan, I'm biased against the Colts. I also realize that one football game will not rebuild a city. I realize that "formidable" is an understatement when it comes to describing this year's Indianapolis team, and that Peyton Manning is one of the greats at the top of his game. I realize that the Saints as a franchise are inexperienced at this point of the postseason, and that Drew Brees has yet to prove himself on the biggest stage. 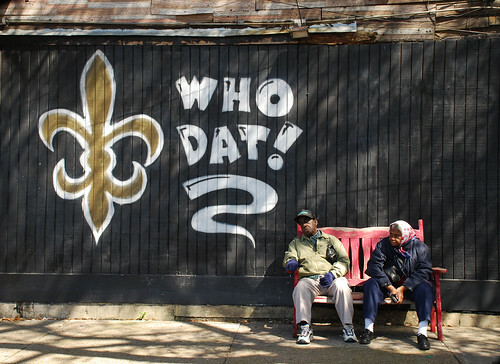 (Although, for what it's worth, people like Football Outsiders who look into deeper layers of the game suggest the Saints might not be quite as much of an underdog as they're being made out to be). But if you don't have a horse in this race, for one reason or another, I think you root for joy to come to one of our country's most beleaguered cities--wherever it comes from, whatever it solves or doesn't solve. I think you root for the Cinderella story. I think you root for Mardi Gras to start early. I'll be Tweeting @cursed_to_first, and back here postgame with more thoughts.